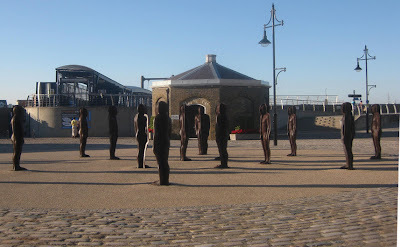 Regular readers will have noticed that your author has a passing interest in public art, and whilst passing Woolwich Arsenal yesterday, he was reminded of a piece by Peter Burke which seemed worthy of sharing. Without descending into pointless artspeak, it seems that there are a number of figures, and Burke made them out of cast iron, as he wanted to achieve an industrial look. However, they are incomplete, as each figure is made out of only three out of a possible four bits, making it possible to see inside. There are sixteen figures, and they were created with the support of the Cass Foundation. For more, click here. I adore the concept of this blog. What I would love to know is whether you can get a dayjob testing these things-to-do out! A French or Scottish version would be fairly handy for me later on!